Over the last few years Storage Giant has gone from strength to strength, opening branches in Cardiff, Swansea and Newport. 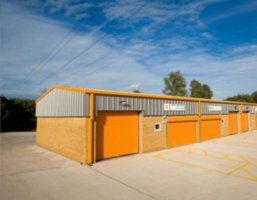 Alongside this success, Simon Williams (the owner of Storage Giant) has also been running a very successful industrial units park in Newport called Estuary Court. Simon has been so successful in his ventures that he has been interview by BBC Wales twice about his accomplishments, most recently in June of this year. Many of the companies that lease the industrial units have been there since the park first opened in 2008, but recently one of our clients has left so we currently have 2 units (unit 19 and 20) with a total combined footprint of 2,800 sq ft available. Estuary Court is located in Queensway Meadows in Newport and the estate has many well-known occupants including Europcar, Thrifty, Yes Loans, Rearo and the BBC. Is currently being used as a vehicle workshop and has an adjoining secure compound of 800 sq ft. Both units are currently joined internally, so you can move between them, or the units can be leased separately. For further information, call the landlord directly at Storage Giant on 01633 271000 and ask for Mark Stroud. Download an information leaflet about the available industrial unit here.